Who else but Christopher Nolan (Inception) would be ambitious, or insane, enough to helm a film that depicts one of the worst military defeats in history? 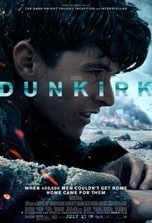 Based on the true account of how British and French forces were cut off and surrounded by the German army with their backs to the sea, Dunkirk is a prime example of how military intelligence often lives up to its reputation as an oxymoron. With the large troop transports blasted into flotsam, a flotilla of fishing boats and pleasure yachts was mobilized to rescue the 330,000 soldiers stranded on the beach at Dunkirk, France. But with enemy planes bombing the beachhead, the stranded soldiers were the very definition of sitting ducks. The film’s action takes place in three different arenas: land (getting off the beach), sea (boarding boats and evading enemy bombs) and air (destroying inbound enemy fighters and bombers). As would be expected with a Nolan film, the action sequences are absolutely mind-blowing and the cinematography by Hoyte Van Hoytema is meticulously crafted. Some of the finest sequences in the film are the dogfights, which effectively meld newer camera techniques with the shuddering, metal shearing, bolt-popping rawness of a classical Hollywood war film. The performances are adequate to the task, but there’s a dearth of dialog and a surfeit of long, penetrating gazes in the film. Case in point, the great Kenneth Branagh (as Commander Bolton) is reduced to a series of slow zoom close-ups that make him appear as if he’s struggling to hold in a suppository. Likewise, James D’Arcy (as Colonel Winnant) does little more than pace back and forth in a state of perpetual agitation, fretfully delivering the same line a dozen different ways over the course of the film. Young performers Fionn Whitehead and Damien Bonnard do the majority of the physical acting, but really aren’t given much to say either. Ironically, the character we are most drawn to is ace pilot Farrier (Tom Hardy), whose face is partially concealed for the majority of the movie. Also ironic is the fact that the film’s biggest drawback is Nolan’s writing. The cause and effect narrative takes us from one event, happening or action scene to the next with very little, if any, character moments in between. Dunkirk’s narrative is comprised of a series of storyboarded sequences and, as such, plays like a cinematic comic strip. The lack of character development leads to a disinterest in the few characters that actually have lines in the film. Indeed, due to the dearth of emotional investment in the characters, we don’t really sympathize with them at all. Though vastly different in theme and tone, Dunkirk is exactly what Titanic would’ve been without the love story. The reason Titanic was a titular success is that James Cameron crafted real characters that we could identify with so that when the inevitable disaster struck we were right there with them, in essence inhabiting their bodies and experiencing the tragedy with them firsthand. Aside from its marvelous acting, directing, detailed period elements and high production values, it’s that immediacy, that soul-possessing intimacy, which made the movie resonate so powerfully with audiences. In Dunkirk, we never get under the skin of the characters…everything is external. Because Dunkirk is so well made, scores of people will disagree with my assessment of the film. However, how much more powerful would the film have been if our connection with the characters was so strong that we could feel the sand between our toes as we stood beside the soldiers or felt the bone-jarring concussion of the bombs impacting on the beach? Taking nothing away from Nolan, who is a fine director in his own right, but in the hands of Steven Spielberg, who would’ve sent the script back for a massive rewrite insisting on richer back stories and more poignant character moments, Dunkirk would’ve been a four star film and Best Picture nominee. Sam Raimi helmed the three numbered Spider-Man films spotlighting Tobey Maguire, Marc Webb directed the two Amazing Spider-Man flicks featuring Andrew Garfield and Jon Watts is the shot caller behind the new subtitled wall-crawler series starring Tom Holland. Despite the changing faces on both sides of the camera, Spider-Man has remained a juggernaut at the box office over the past fifteen years. This sixth Spider-Man film makes a wise decision right out of the gate—it skips the spider bite origin story, which we’ve seen ad nauseam by now, and instead gives the movie context by cleverly showing a POV camcorder recording of Spider-Man’s derring-do during the climactic battle in Captain America: Civil War (2016). Kudos to Watts and his team of five writers for electing not to waste an hour of screen time on Spidey’s back story before initiating the actual story. 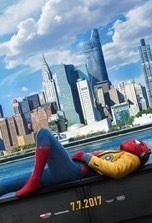 The film opens eight years in the past and shows foreman Adrian Toomes (Michael Keaton) losing a contract to the government while cleaning up the debris after the NYC alien invasion as depicted in The Avengers (2012). Toomes discovers some alien technology in the rubble, fashions it into a bird suit and becomes villain Vulture (to remain consistent with Keaton’s other avian themed characters in Batman and Birdman). Meantime, Peter Parker (Holland) is desperately trying to impress a girl he’s crushing on at school while keeping up his grades and maintaining an internship (wink, wink) with Tony Stark (Robert Downey Jr.). Aunt May (Marisa Tomei) can tell Peter is going through some difficulties, but chalks it up to normal teenage changes. Peter’s friend, Ned (Jacob Batalon), provides some comic relief, and becomes trusted assistant (like Stark’s Happy Hogan) when he accidentally stumbles onto the secret of Peter’s alter ego. The story heats up about halfway into the film when Spidey spies on an illegal weapon’s exchange one night. After clumsily blowing his own cover (the fiery red suit certainly doesn’t help on recon missions), Spidey unwittingly interrupts the shady dealings of Vulture’s men, which sets off a chain reaction that eventually pits Spidey and Vulture in mortal combat. The film’s resolution pretty much dictates itself from there. There’s a good deal of high school angst in the movie, especially in the early goings, which hearkens back to the very first film. These scenes establish the setting and characters, provide background for Peter and are effective in showing the exigencies of his daily life, which, of course, is a stark contrast to his life at night. Although necessary for grounding the film and giving us a glimpse into the struggles of the real person behind the mask, these school scenes, particularly the prom proceedings, feel like they were lifted right out of an ABC Family or CW drama. However, more so than McGuire and Garfield, Holland nails Peter’s wide-eyed, overly idealistic and adorably naïve characteristics. Peter’s two caring, if absentee, guardians—May and Stark—offer him drive-by advice, but never when he needs it most…like when he discovers the identity of his archnemesis. As for Vulture, Keaton delivers an exceedingly restrained performance, especially when compared to the prototypical Marvel antagonist. We can identify with Toomes because he’s just an ordinary guy who makes a bad decision for the right reason…to provide for his family (and stick it to the government). Refreshingly, Keaton’s voice doesn’t change for effect, nor does he become more bombastic in speech and manner while inhabiting Vulture’s wing suit. As such, Vulture is one of the most realistic comic book movie villains ever (ironically, the runner-up is Spider-Man 2’s Alfred Molina as Doc Ock). Sadly, Vulture never strikes fear into the viewer and doesn’t really test Spidey’s mettle, which is a significant narrative misfire. This Spidey outing avoids many of the gimmicks employed in the earlier movies, i.e. rescuing cats in trees, etc, and offers some humorous asides, like when Spidey runs out of buildings to sling webs from and must jog a mile across a golf course in order to respond to an emergency. Though slow in developing, Homecoming is an exciting superhero action film once the plot kicks into high gear. If the movie has any weak spots, it’s that the story is surprisingly light-weight and that Spidey can never truly spread his wings and fly due to the intermittent avuncular advice and canned wisdom from Iron Man and Captain America (Chris Evans), respectively. Expanding on that analogy, it’s time for Spidey to fly solo in the next film. Like its young star, this third attempt at launching a Spider-Man franchise has loads of potential. Now it’s time to see if the series can live up to that potential or collapse under the weight of it.